The story about the interesting recent find of a small horse bone from the Roman circus has got in a bit of tangle. The bone points to an animal about the size of a medium to large Shetland pony. There is no reason to suppose that it actually was one. I only introduced the idea of Shetland ponies because I thought it would help give people an idea of the height of the animal. In reality, the circus horse would simply have been a small horse. The issue is just how small? The likely size of the circus horses is an ever-present topic. Horse remains from Roman period excavations are typically from small animals although not normally quite so small as the one we found recently in the circus. We have rebuilt the base of the starting gates and visitors, who own or work with horses and who see the gates, sometimes remark how small the horses must have been to fit in them. 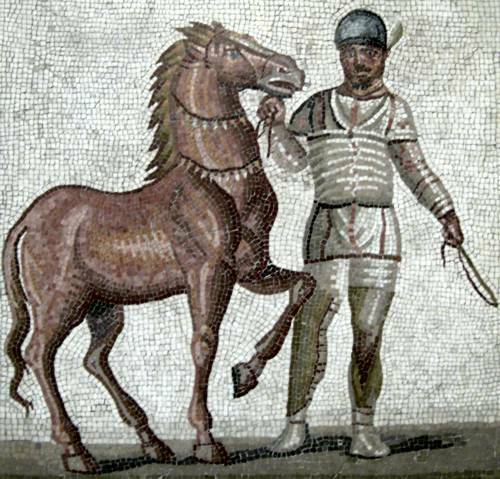 On top of this, contemporary Roman images which feature charioteers and their horses together nearly always show the men relatively large in relation to the animals. Assuming the charioteers were small in the first place, it looks as if the horses were something like nine hands high. Of course artistic licence could be at work here and the horses are shown undersize since the main focus of these images is usually (but not always though) the men and not the horses. Like archaeology generally, things rarely turn out to be simple and clear cut. And we are, afterall, only talking here about a single bone. There is much work to be done on all this. We need to find lots of horse bones associated with the circus and show that they are smaller than elsewhere. We are not at this stage. This discovery is just a start! A comment has been left on our Facebook page that the idea of small horses racing in a circus is a bit of a downer since this would have made for a less exciting spectacle. I agree with this too although there is an upside to all this. Films like Ben-Hur (all of them) don’t show proper chariot racing in proper chariots. They show something more akin to men standing effortlessly in the backs of very stable and heavy carts. All they lack are safety belts and air bags! It’s true that races featuring small horses were probably not as fast as those in Ben-Hur (even allowing for the fact they are speeded up in the films!) but the real thing was much more dangerous and the charioteers needed to be very fit with lots of body strength, balance, and skill. The charioteers could have done with three hands to ride their chariots – one to hold the reins, another to hold the whip, and a third to hold on to the vehicle so as to stop themselves being thrown off it. To solve the problem, they kept themselves upright on the chariot by winding the reins in a tight loop around their backs and bracing themselves with their shins against the inside of the front of it. They didn’t have steering wheels of course to guide the vehicle so they used their horses to turn around the central barrier (which they had to whizz around 14 times in each race). They raced anticlockwise so they would lean back to their right so as to pull on the left-hand horses and slow them down while bending forward from the waist upwards to loosen the reins on the right-hand ones and give them a flick of the whip to speed them up or keep them going so as to force the chariot to wheel round. These charioteers needed to be brave, physically strong, and very athletic. It was important they didn’t fall off the chariot because, with the reins around their backs, they could be dragged around the track and risk serious injury or death. Believe me, small horses or not, there would be no shortage of drama during these races. So you see we need to find somebody with a team of small horses to come to Colchester and have a go at proper chariot racing Roman style. I’m not sure if it has ever been been tried before. At least not properly. Any takers?